Three years ago our exotic grower, Anton Roux, planted two very rare trees in the Babylonstoren garden: Etrog citrons. A now lesser-known variety of citrus, the citron was once a kitchen staple with cultural and religious significance and medicinal properties. This winter season, we were delighted when one of the trees came into its own and produced its first two fruits. Sadly, only one survived – the other was plucked by a curious visitor to the garden. So what is a citron fruit? Not to be confused with either lemons or oranges, this plump round or lemon-shaped fruit is yellow-orange in colour and smooth, with deep ridges emanating from the stem. The peel is thick and pithy; the flesh segmented and small. The leaves and flowers produce a wonderful lemon scent, and the flavour is sharp and acidic with a slight bitterness. It’s not often eaten in its raw state and is best used in marmalade preserves, blended into juices or to complement savoury dishes. The thick peel is cured in brine, or candied and eaten as a confection. The citron is an ancient fruit that was first introduced to the Mediterranean in the Third Century BC by the Persians. However, its origins can be traced back to Asia. Traditionally, during the Jewish Feast of Tabernacles, a fresh and unmarked citron stands as a characteristic symbol of the 40-year Jewish desert resistance. It is also recognised as an emblem of the Sukkoth feast, where God is given thanks for fertility and plant growth. Apart from its role in the kitchen, the citron is used medicinally to treat a range of ailments, from seasickness and scurvy to pulmonary troubles and rheumatism. 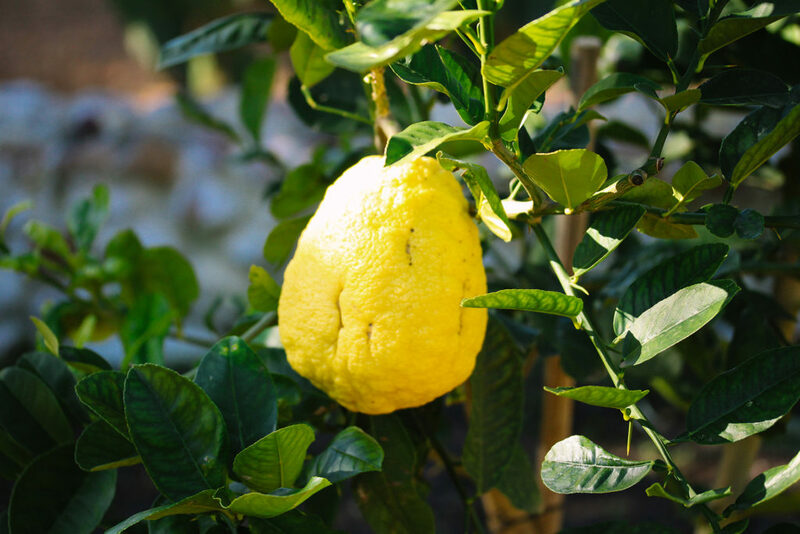 The citron makes a wonderful addition to a citrus orchard but also flourishes in a container on the stoep. For more information about how to grow and care for your own citron tree, refer to the detailed guide on the Candide app. Do you have citron plants that one can buy? i would love to own one. Hi Liezl, no we don’t sell any citron trees. Dear Liezl, now we don’t sell any plants. Tulbagh Bosbou Nursery is your best bet. I made two cuttings from my mothers citron tree in Stellenbosch which have both taken. I am thrilled as the house was sold. My mother used to make sieter konfyt which she assured me was a very old Cape Dutch recipe. Very few people know about sieter konfyt. I will make you a cutting. The history of the citron is really interesting. We’re so happy to hear that you managed to get that precious cutting! Hi, Thanks for closing the circle! I listened to a talk on radio dedicated to ‘making marmalade. The ultimate fruit was deemed the ‘citron’, which according to the guest on the chat show, was not available in South Africa..! I’m off to BT to buy my jar this weekend… baie dankie! Excellent article! These are occasionally seen in gardens here in Los Angeles, where the climate is Mediterranean type. I’m always looking for food news for the “Food” page of Westafricandocumentary.com. Check it out! Thanks for the link, Paris. We’ll have a look! Where can one buy a citron tree? Are they available at BS? Dear Steve, no we don’t sell it. Tulbagh Bosbou nursery is your best bet. Due to a World Wide shortage of ETROG ( selling at US$ 500.00 — even President Trump is moaning ) perhaps this is the route and reason for your missing fruit ? What a marvellous man Mr. Roux is to have re-introduced this useful fruit! My grandmother had a large cirton tree in her orchard in Bulawayo, which she grew from a seed collected in Stellenbosch. Sadly I was not wise enough to keep the seed for my own garden. It made wonderful conserve,and was excellent in a Three-Fruit Marmalade. What a lovely story. Amazing how we all have a connection with food that brings back sweet memories. usual peel. I’ve been craving those golden preserves. So happy to learn about the come back of the fabulous citron. We hope you find some fresh citrons again. We’re sure they will make a comeback. We’re not sure. Tulbagh Bosbou nursery is your best bet! Cederberg Citrus Nursery produces citrus trees for Babylonstoren’s commercial planting and they would be interested to propogate Citron trees if at least 50 enthusiasts commit to planting in the Western Cape?! Why only the Western Cape ? Please let me know if I could help get the count to 50. May be 25 people take 2 each. want to see you soon, will you be there? Dear Hermi, they are here on the farm most days. A wonderful interesting post! This explains why citron was always listed in fruit cakes very old recipe books! I live in Riebeek West in an old Smuts house. I have an old tree and am sure the fruits are Citroen’s. The most delicious thick skinned juicy ‘lemons’. Everyone in the neighborhood picks from this generous tree! Is citron the same thing as the citrus fruit I know as “kinderkoppie”? Hi Kirstey, thank you for the recommendation! At this price I wonder where this specialized fruit is sourced for adherent Jewish people in SA ? Hi Chris. Thank you so much for your interesting commentary regarding the citron! 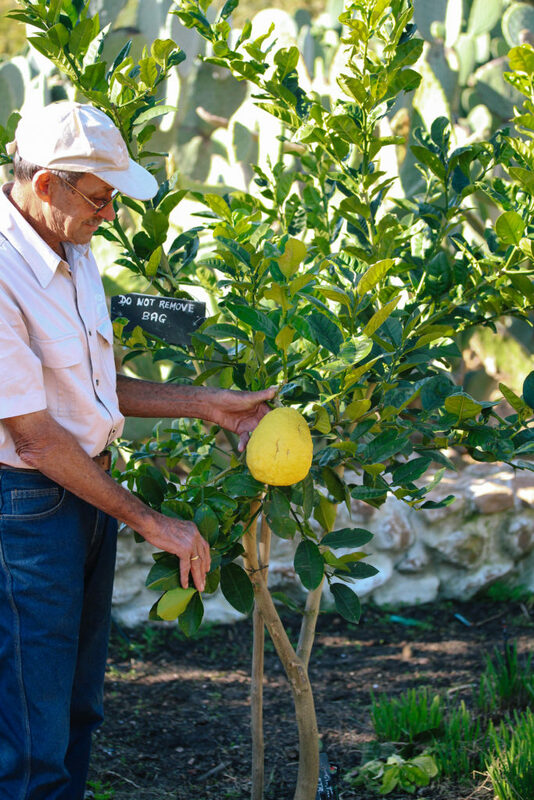 We love our citron and Oom Anton certainly keeps a watchful eye over them. Regarding the etrog, we are always open and willing to bring many varieties to the garden – so thanks for the tip!